Hot flashes, one of the most common menopause symptoms, can be one of the most difficult symptoms to live with. Imagine your body burning up, your heart racing, and your breath becoming shallow - this is what many menopausal women have to deal with on a regular basis. It can lead to redness of the face and chest, excessive sweating, and difficulty concentrating. Luckily, there are many options for treating this symptom. Learn more about how to manage hot flashes. Being overweight can be a contributing factor of hot flashes. Studies show that those with a high body mass index (BMI) will struggle with this symptom more often than others. It is advised by healthcare professionals to incorporate 2.5 hours of physical activity into your week. This can be yoga, cardio, or aerobics. However, be careful to not exercise before you go to sleep, as this is known to cause night sweats. Studies have found that anxiety can double the severity of hot flash symptoms. Stress is one of the main triggers for these bursts of heat, so stress relief is extremely important during this time. Not only will this help you cope with attacks, but it can also help you avoid them altogether. Researchers and specialists suggest fifteen minutes of paced breathing daily for relaxation. The inhale should be five seconds deep into your belly, and the exhale should be five seconds releasing all concerns. For a more meditative experience, close your eyes and turn on ambient music or nature sounds. While many people assume that prescription medicines are the best way to treat hot flashes, alternative medicines, such as phytoestrogenic plants, can be effective in treating menopause symptoms. 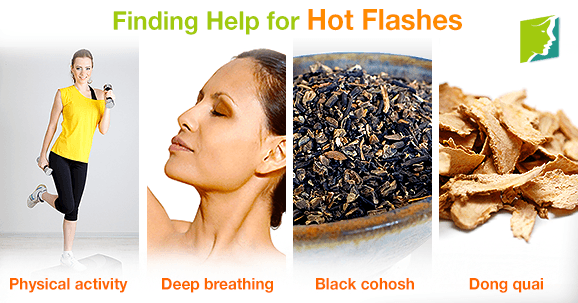 Black cohosh, for example, was used by Native Americans for many purposes, such as menopausal hot flashes. The high phytoestrogen content helps to rebalance your body temperature, since your estrogen levels otherwise drop during this time. Tea and supplemental form are both suitable options. Dong quai is another powerful phytoestrogenic plant. Long used in Chinese medicine for hot flashes, the potency of this plant is celebrated by menopausal women. Again, consumption of a supplement or tea can rebalance your body's homeostasis and provide you with relief. As you try these healing measures one by one, you will notice more improvement over time. Whether by plants, movement, or some good old relaxation, the severity, duration, and frequency of your hot flashes can be reduced. Do not let the uncomfortable symptoms take over. Take it into your own hands to correct your situation. Hot flashes, sweats, and chills often go hand-in-hand. Upsetting and annoying, such menopause symptoms can become a real burden to menopausal women. For hot flashes, many healthcare professionals recommend making a few dietary changes. Read on to learn about five foods that can help relieve hot flashes. Hot flashes before the age of 40 are unusual and can be alarming. To find out the causes behind hot flashes before menopausal age, click here.